Staff Selection Commission has cancelled Stenographer exam Shift 1 which was held from 10:00 am to 12:00 noon on February 5, 2019. Now Exam is on 8th February 2019. 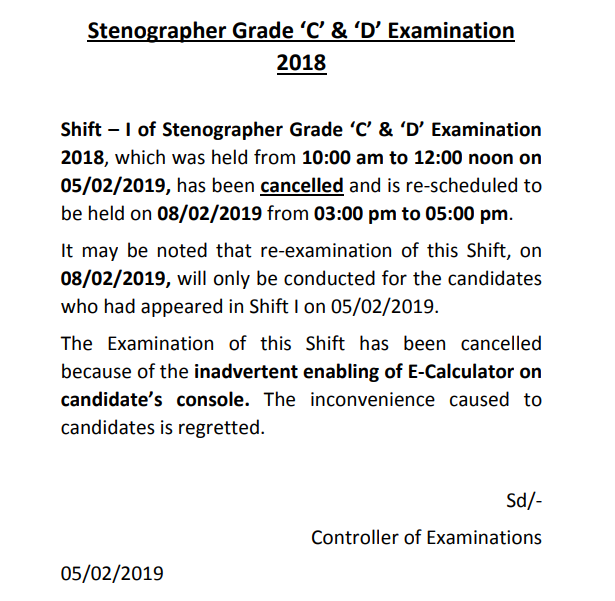 SSC Stenographer Exam Cancelled: Staff Selection Commission has been cancelled the exam of Stenographer Grade 'C' and 'D' Shift 1, which was held from 10:00 am to 12:00 noon on February 5, 2019. As per official notice published at official website of the commission - the reason of cancellation is tech failure. "The Examination of this Shift has been cancelled because of the inadvertent enabling of E-Calculator on candidate's console. The inconvenience caused to candidates is regretted," the SSC notification regarding Stenographer exam said. "Shift - I of Stenographer Grade 'C' & 'D' Examination 2018, which was held from 10:00 am to 12:00 noon on 05/02/2019, has been cancelled and is re-scheduled to be held on 08/02/2019 from 03:00 pm to 05:00 pm," as per SSC official Notice. "It may be noted that re-examination of this Shift, on 08/02/2019, will only be conducted for the candidates who had appeared in Shift I on 05/02/2019," it said.